There are lots of great Bossier events happening in July. Gather your friends and family for a little summer fun at any of these exciting events. The Belles are in town and ready to honor the ladies and gentlemen who served in the armed forces. For three days this trio will perform songs that take you back in time. Don’t miss this patriotic event. General admission tickets are $15. Put your head in the clouds and enjoy artwork capturing the scenes from the Red River Balloon Rally. This exhibit captures the beauty of the skies in Shreveport-Bossier City during the hot air balloon events by local artists. The exhibit is free, open to the public and runs through July 31. If you are new to Bossier, this annual event is a must-see. 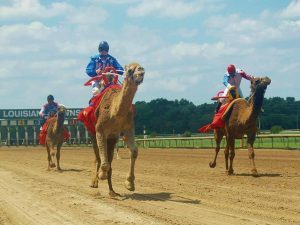 Exotic animals such as camels and ostriches will race between live horse races. Watch as the jockeys lean toward the finish line for their chance to win. Children can enjoy fun with face painting at the Kid Zone and food trucks will open at noon. Can’t go to Spain but always wanted to run with the bulls? Attend Geaux Toro in the East Bank District and run with the ladies of from Twin City Roller Derby. Tickets at $30 and the proceeds go to the Gingerbread House and the Twin City Roller Derby team. After the race, enjoy food and live music. Learn about the events of Shreveport’s red light district based on historical events. As an old mansion is set to be torn down, Ian finds out that the location was owned by a notorious madame named Moma. Don’t miss what unfolds as the past becomes relevant to the future. Tickets are $21. Want to meet The Ladies Man? Tim Meadows will perform his comedy live in Bossier City for free. Prepare yourself for humorous insights and unique punchlines. Seating is limited and you must be 18 or older to attend. For more information, call 456-3312. Journey out and enjoy fellowship with local riders. Bayou Bistreaux and The Hot Dawg Hut will offer up special lunch options and Glace Cajun Shaved Ice will provide cold treats and drinks. Beer is free and The Syndicate will perform live music. Spend a night with your family enjoying Dreamwork’s hit movie, Trolls. Watch the movie and have fun in the Kid Zone. Food trucks will offer menu items, but be sure to bring a lawn chair and blanket. This is free and open to the public. Enjoy your favorite anime characters during a weekend full of celebration. A diverse group of vendors, guests and artists will attend to interact with fans. Tickets are $20 per day and $30 for the weekend. Be a part of the St. Jude Dream Home and enjoy a night of fun. 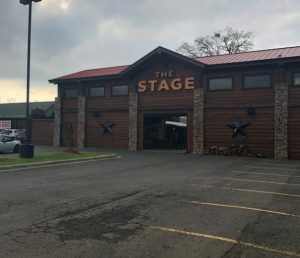 Rodgers Homes and Construction, St. Jude Dream Home builder, invites the community out to The Stage to celebrate with food, music and amazing silent auction items. The goal is to raise more money for the children of St. Judes. For information on sponsorships, donations for the silent auction, or helping with the event, contact jenny59@gmail.com.